Bhubaneswar: The Bahuda Yatra, the return journey of Lord Jagannath, Lord Balabhadra and Devi Subhadra, concluded peacefully at Shrivanikhetra on 3rd July. Rituals associated with this auspicious occasion like Mangala Arati, Mailama, Tadapalagi, Rosha Homa, Abakasha, Surya Pooja, Dwarapala Pooja, etc commenced early morning as per the ethics and rituals of Mahaprabhu Shri Jagannath Temple of Shrikshetra, Puri. Pahandi Bije of the three deities was performed in the afternoon, after the observance of holy ritual of Chherapahanra by Kamalakant Rout, Temple Administrator. Pulling of the three chariots from the ‘Shri Gundicha Temple’ to Shrivanikshetra of KISS started at 4.30 PM. Women devotees pull Subhadra’s Chariot. 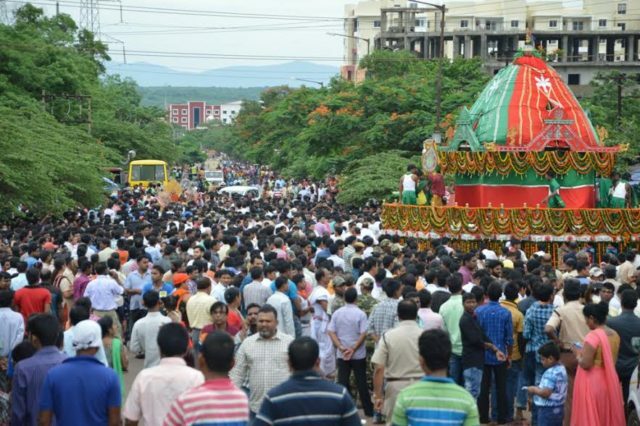 More than 30 thousands of local devotees, staffs and students of KISS and KIIT gathered to observe the Bahuda Yatra at KISS. 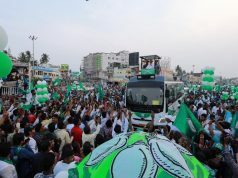 Several other programmes like Bhajana Samaroh by different musical groups from Odisha and outside, Prabachana and other cultural programmes were organised between the Ratha Yatra and Bahuda Yatra here. The Suna Besha of Deities will be held on 4th July on Ekadashi Tithi.